There are two simultaneous stories in A Shadow's Breath. There's "then", a time when Tessa is focussed on one thing – escaping her small country town. There's also "now", set at the scene of a car crash in impassable bush. How she and Nick ended up there is played out in the "then" chapters as they struggle to survive "now". These two realities thread through and around each other so the windows to Tessa's worlds open just a little at a time. It's just as well. Her past is unbearable in many ways but her present is a certifiable mess. "Then" begins with the abusive defacto moving out and Tessa'a mum giving up drinking. Tess tries not to get her hopes up but week after week the place she lives in begins to feel like the home she's longed for. When her mum gives Tessa a sketchbook, new energy flows through her entire being. Tessa remembers her passion for colour, texture and creating, joys she'd turned her back on when the bum was around. Then Nick happens and everything changes. A Shadow's Breath is easy to read yet complex. It's filled with heartache, determination, raw honesty and fear. Whether you devour it in one sitting or try to make it last as long as you can by forcing yourself to pause for breath after a few short chapters, be prepared. A Shadow's Breath will haunt you long after the tale is complete. With themes including addiction, abuse, survival and the path to forgiveness, A Shadow's Breath is not for the faint-hearted, but it's so filled with heart that it's hard to resist. If you enjoyed The Whole of My World and One True Thing, you are sure to love A Shadow's Breath. 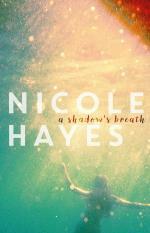 But be warned: this is Nicole Hayes' most powerful novel yet. She takes you deeper and into far more dangerous territory than she ever has before.